Zoar Gap opens up as rafters pass the last turn below Negus Mountain on river left. A landscaped hillside on river right also comes into view where state agencies and highway crews cut the slope back in the early 1990’s to prevent mudslides onto River Road. 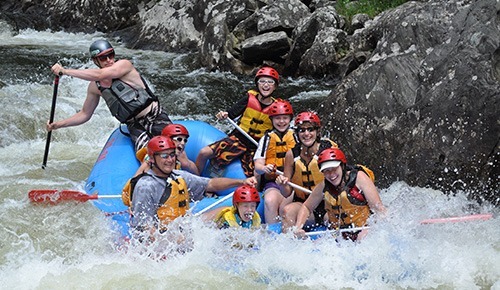 The rafting approach to Zoar Gap can be made from either bank of the river, but is more commonly taken on river right. This brings rafts close to the portage trail and away from a shallow gravel bar that spans most of the river. There are raft sized eddies in the approach to “The Gap” on river left about 100 yards above the first drop. If needed, these are large enough to hold multiple rafts for safety or to wait for the water release to fill “The Gap” to its full volume. The standard final 100 hundred yard entry is a straight, center wave train with 1’ – 3’ standing waves and small eddies behind large boulders on left and right. The entry can also be made from the far left at flows above 1000cfs. 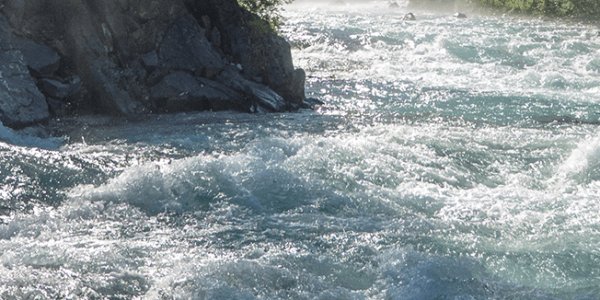 There are three options for running the main drop in a raft at flows between 500cfs and approximately 1500cfs. A ledge on river left and recently added material following 2011’s Hurricane Irene form the central tongue, which is the main route through the Gap. After entering the tongue, the more aggressive route is slightly river left to drop into two wave-holes left of center. The first of these holes in “crunchy” and can lead to raft swimmers. The milder route moves right of center to avoid the two holes. The new line accentuated by Hurricane Irene and now the preferred line for many rafts is a move left into the tail of the big left eddy. This forces the raft to line up for O.S. Rock, which you can be avoided by fighting the leftward pull of the eddy and down a chute between OS and the first center wave-hole. This route is tricky because of the eddy currents you must cross, but can be the most fluid of the three runs. Please contact Crab Apple for guided whitewater rafting excursions on the Deerfield River in Massachusetts.